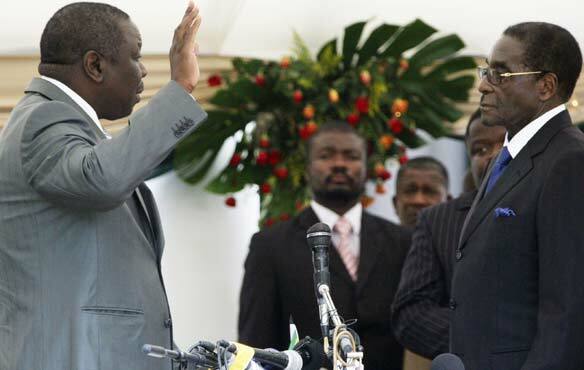 Mugabe swears in Tsvangirai as Prime Minister of Zimbabwe. 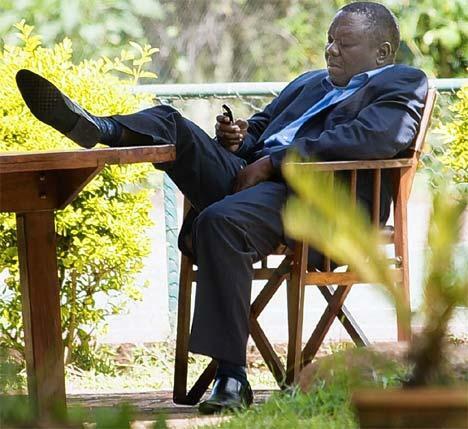 I'm not sure that Morgan Tsvangirai and the MDC have a clear strategy to counter the infidelity of Mugabe and Zanu PF in this marriage. Why does the MDC think this arrangement can work only if they are willing to prostrate themselves before Zanu PF in supplication? I think they're seriously undermining themselves by giving Mugabe and Zanu the semblance of power and authority. I say 'semblance' because even though Mugabe's authority is still constitutionally enshrined, we all know it is worth no more than hot air since his position is really underpinned by nothing other than the GPA and the MDC's willingness to subscribe to it. In that sense, why does the MDC not at least show themselves to be wielding real political authority as given to it by the voters at the last elections? What is stopping them from confidently and consistently talking up their values and how, in the final victory over the dictatorship, punishment for transgressions against the law and the rights of citizens will be dispensed swiftly? After the March 2008 elections, there is a sense in Zimbabwean politics of things having moved beyond the dictatorship's control. The regional outrage at the conduct of the June 27 elections can only mean there will be no appetite for excusing such egregious conduct again should Mugabe's successors try to repeat the same strategy of retaining power. Why, even this thing after June 27 wasn't salvageable outside of a power-sharing arrangement. 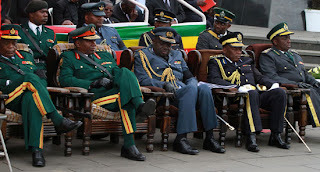 The SADC or AU never ventured to entertain any arrangement that only had Zanu PF in power after June 27. In a sense you could say there's now a point beyond which regional diplomacy cannot be expected to cover up violations of electoral conduct. June 27 was one such and Zanu could only be rescued by enlisting the participation of the victims of its violence and treachery. And so given this scenario, I'm at a loss as to why the MDC does not seek to hammer home to all those so-called hardliners that the major shift in power relations in Zimbabwean politics brought about by the March elections can only be completed rather than reversed in future elections and that their comeuppance will surely come. 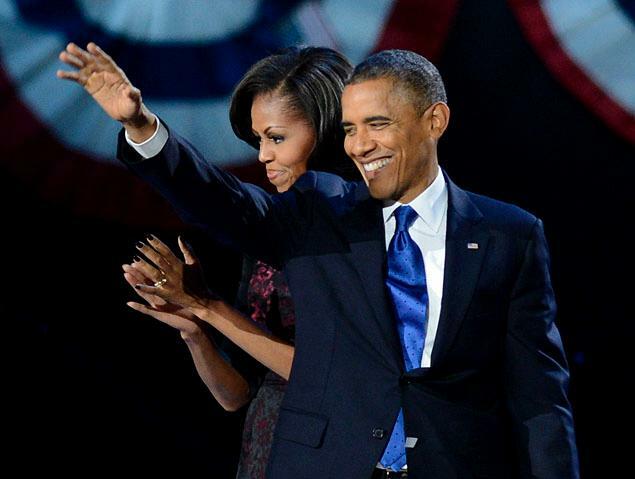 It's a pity our politics is always about who gets what; it's about the spoils of power. In my view it would have been infinitely more attractive to have some of the MDC's big guns deliberately stay out of the unity government so that the party remains strong and focussed rather than have its agenda dictated by the imperatives of the power-sharing government. Having every senior figure in the compromise government stunts party policy and party clarity on matters of its own values and principles. Having senior figures outside helps to ensure that the party holds its members in the GPA to account on the basis of party policy and principle. As it is, everyone is just drifting in the wind of this inconvenient marriage, to be dumped wherever the draught lands them! brief interval of time. But have you assume of why we generally speak about it? liquid detergent into it and rinse. http://www. This article has truly peaked my interest. I'm going to take a note of your website and keep checking for new information about once a week. I opted in for your RSS feed as well. What's up mates, its fantastic post about educationand fully explained, keep it up all the time. hey there and thank you for your info – I've definitely picked up something new from right here. I did however expertise several technical issues using this website, since I experienced to reload the website many times previous to I could get it to load correctly. I had been wondering if your web hosting is OK? Not that I am complaining, but sluggish loading instances times will very frequently affect your placement in google and could damage your quality score if ads and marketing with Adwords. Well I am adding this RSS to my e-mail and could look out for a lot more of your respective interesting content. Ensure that you update this again soon. Heya i'm for the primary time here. I came across this board and I in finding It really useful & it helped me out a lot. I am hoping to give one thing again and aid others such as you helped me. Your mode of telling all in this article is truly nice, every one can easily be aware of it, Thanks a lot. you're in point of fact a just right webmaster. The site loading speed is amazing. It kind of feels that you're doing any distinctive trick. What's up, after reading this awesome article i am as well happy to share my knowledge here with colleagues. And after this article "MDC must be more forthright about its values in this govt". questions for you if it's allright. Is it only me or does it give the impression like some of these remarks come across like left by brain dead folks? :-P And, if you are writing at additional places, I would like to follow anything new you have to post. Could you make a list the complete urls of all your communal pages like your twitter feed, Facebook page or linkedin profile? My blog has a lot of exclusive content I've either written myself or outsourced but it seems a lot of it is popping it up all over the internet without my permission. Do you know any methods to help prevent content from being ripped off? I'd truly appreciate it. if they are left by brain dead folks? :-P And, if you are posting on additional sites, I'd like to keep up with you. Could you list all of your community pages like your Facebook page, twitter feed, or linkedin profile?